I’ll admit it — for many years my eyes glossed right over the ash content of a forage sample. That’s not the case anymore. Ash content in harvested forages can have a significant role in animal performance. Effectively, think of ash as minerals, components such as calcium, phosphorus, potassium, and magnesium. We normally regard these as essential and beneficial to both plant and livestock health, and that’s true for about the 8 percent of internal ash content in alfalfa and the 6 percent inherent in grass. The other component of forage ash content is external soil contamination, primarily silica. While silica isn’t necessarily detrimental to an animal, it does take the place of more desirable energy-dense nutrients on a one-to-one basis. Soil contamination also carries the risk of introducing undesirable fermentation microorganisms such as clostridium to the forage or animals. Typically, when a large collection of forage samples are analyzed, ash content ranges from 5 to 18 percent. Values trend in the lower end of that range for grasses and dry hay samples and are often higher for haylage. 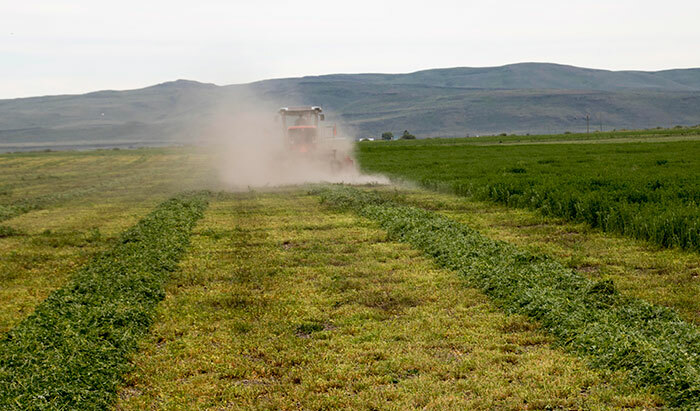 Though it’s impossible to keep all soil contamination out of harvested forage, a good maximum value to aim for is 11 percent, or about 3 percent external soil contamination in the case of alfalfa. High forage ash content is aggravated by both dry weather (dusty conditions) and wet soils (muddy conditions). Heavy rains have the potential to splash soil particles onto forage, especially if the forage is lodged. Factors such as rodent holes, previous flooding, and gravel roads will also contribute to higher ash values in localized field areas. The greater attention to ash content has now led many forage laboratories to offer a neutral detergent fiber (NDF) analysis that is ash-free. This is designated as NDFom or aNDFom on the forage analysis report form. 1. Experiment with cutting height. Though a low cutting height offers more yield potential, it also results in more soil being incorporated into the forage. A cutting height of 3 inches for alfalfa and 4 inches for grass is a good compromise. 2. Make wide swaths. This will not only speed the drying rate, but also keep the wilting forage on top of the stubble and off the ground. 3. Use flat knives on disc mowers. These will create less suction and introduce less soil into the forage than angled knives. 4. Make sure rakes and tedders are properly adjusted. The goal is to move forage, not the soil. This is easiest when the tines are adjusted so they don’t or barely touch the ground. 5. Rake as little as possible. Often hay has to be raked, but use strategies that minimize hay movement over the ground. Mergers are much more effective in this regard as the hay is actually picked up before being moved. 6. Control rodents. In addition to the damage they do to fields and plants, their dirt mounds are easily incorporated into forage windrows. 7. Keep storage areas clean. Soil can be added at the storage and loading site as easily as in the field. Keep silage bags and silo piles on well-drained, solid surfaces. Ash is one of those hidden anti-quality factors that can impede animal performance. As you view your new crop forage analysis, take a close look at the ash content in addition to the usual forage quality metrics. Hopefully, you’ll be able to claim membership in the under 11 percent club.